Should the CSeries’ Paris debut be judged a success or failure? 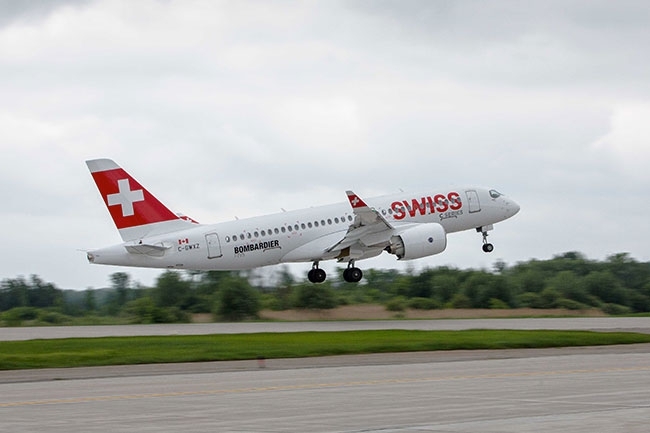 Bombardier did succeed in exciting the crowds at the Paris Air Show with an impressive flying display of the CS300, while a CS100 in the colours of launch customer SWISS, anchored the static display. But while the airframer kicked off the bi-annual air show with an announcement that SWISS had converted 10 of its CS100 orders to the larger CS300, the aircraft departed Paris without a single new order. Despite a lack of orders Should the CSeries’ Paris debut be judged a success or failure? “With both versions of the new CSeries family of aircraft in our ranks, we can be highly flexible in tailoring capacity to demand on our European routes,” said Harry Hohmeister, chief executive of SWISS. The re-arranged order book also widens the overall gap between the CS300 and the aircraft it will most closely go head-to-head against: the Airbus A319neo, Boeing 737 Max 7 and Embraer E195 E2. According to the U.K.’s Flightglobal Ascend Fleets, the CS300 has outpaced all three competitors combined in firm orders (180 versus 134) and options (96 versus 25), although Airbus and Boeing have eclipsed the CSeries in total orders. Still, at this stage in the airplane’s bumpy development, you look for good news where you can. And Bombardier’s retooled executive team, led by Fred Cromer, president of Bombardier Commercial Aircraft, arrived at Le Bourget with a belly full. This year’s Paris Air Show was already being billed as a “benign affair” with fewer aircraft on display, no major product launches or expected eye popping orders that have coloured past shows. Bombardier had already tamped down expectations of any orders in advance of the duo of aircraft making the trans-Atlantic flight (the CS100 returned to Montreal from Zurich non-stop in just over seven hours), although rumours circulated throughout the show of an order for 30 units. Bombardier’s Paris lift was always going to come from showing up and inserting the CS300 into the flying display after three months of testing. “We are proud to present the first all-new designed, single-aisle aircraft that the industry has seen in over 25 years,” Cromer said. The big news, however, was Cromer’s unprecedented “beating the initial brochure” announcement that both the CS100 and CS300 will exceed original targets for fuel burn, payload, range and airfield performance. The aircraft’s maximum range is approximately 648 kilometres more than originally targetted and has a more than 20 per cent fuel burn advantage compared to in-production aircraft, and a greater than 10 per cent advantage compared to re-engined aircraft such as the new single-aisle Airbus and Boeings. Operators will be able to add up to 15 more seats than originally planned. “The CSeries performance is better than advertised. This will provide increased profitability and market access for operators,” Cromer said. The airplane’s community noise level is also below the Federal Aviation Authority’s Stage 4 limit, which should remove the biggest thorn against the CSeries operating out of Toronto’s downtown waterfront airport. Beating the brochure is one thing: can Bombardier now beat expectations, which includes a couple of shaky orders by Republic Airlines and in Russia. Airbus predicts that more than 32,000 100-seat plus aircraft will be delivered by 2034. Approximately half of these will be added aircraft to accommodate passenger growth. Narrow-body aircraft will continue to lead the pack with more than one-third of production going to low-cost carriers. Colin Bole, senior vice-president of sales and asset management reports “surprising” interest from some low-cost and charter carriers, in addition to legacy and regional airlines. For its part, Bombardier forecasts demand for 12,700 aircraft deliveries in the 60- to 150-seat segment, including 7,000 deliveries of aircraft in the 100- to 150-seat range over the next 20 years. “[The] segment, which has not been the focus of aircraft development for at least the past two decades, will witness a major fleet transformation with the entry-into-service of new clean-sheet aircraft designs,” the airframer said in a statement. Pricing will continue to be a problem with the CSeries; Bombardier cannot afford to match the deals being offered by its larger rivals and continues to bet that superior economics will bridge the financing gap. Beating the brochure will make selling the aircraft a bit easier, Cromer told Reuters. Despite a lack of orders, Paris was a head-turning success for the CSeries and new orders can be expected before the CS100 enters service next year.